It's not unusual for brewpub operations to produce a wide range of beers in a short space of time; the ability to do so is often part of the appeal for the people behind them. It isn't that common to see a brewpub also package so many of its beers and send them into the wider world. But Cheltenham's Bad Shepherd – not quite yet a year old – has already popped around a dozen different beers into bottles and the concept behind this one suggests there will be many more to follow. It's the first in the Brew Crew Series whereby different staff members will get to contribute to the design and brew of a beer. 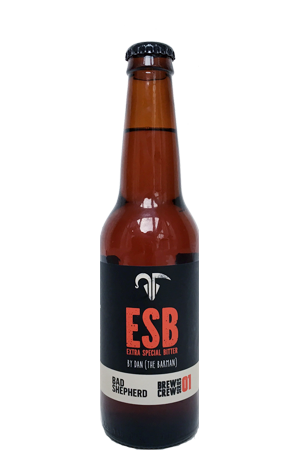 First up is Barman Dan who has requested he be immortalised via water, malt, hops and yeast in the form of an ESB. And not the sort of New World take on the style you occasionally see doing the rounds but a traditionally minded British one. It pours a clear copper, with aromas of dried fruit – apricot and sultanas – alongside bready, caramel malts. There's fruitiness at play from the English ale yeast before an earthy, drying bitterness reminds you what the B stands for.